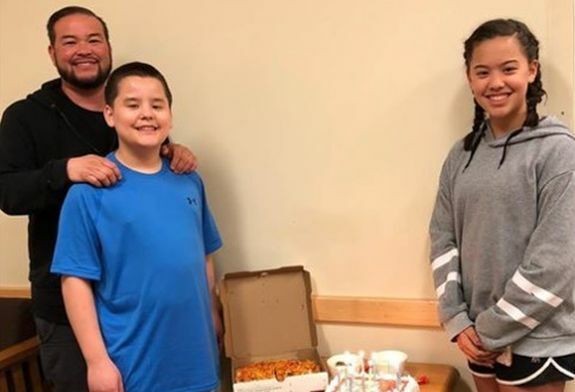 Jon Gosselin spent Thursday celebrating with at least a few of his sextuplets, who just turned 14. The former reality star posted photos of himself with his daughter Hannah, as well as with his son, Collin, who Kate Plus 8 viewers rarely, if ever, see, due to Collin living away from his family at a special needs facility. “Glad I could celebrate my son Collin’s 14th birthday with him and his sister!” Jon captioned the photo. Longtime fans of the show wrote in the photo’s comment section that they were pleased to finally see Collin. “Happy Birthday Collin & Hannah! No matter what problem parents have kids need their dad as much as their mom. So happy for you Jon to be able to enjoy time with two of your kids,” another fan wrote. It appears that Jon has come a long way in his relationship with Collin. Back in 2016, Jon told Entertainment Tonight that his ex-wife, Kate Gosselin, wouldn’t even tell him which facility she had placed Collin in. “I have an idea where he is but I don’t really know where he is,” Jon said at the time. “I mean, I ask but [Kate] doesn’t tell me. She doesn’t answer any of my texts. Kate has stated that Collin lives at a facility that has a program to help with his behavioral issues. Jon and Kate have both said that only some of their eight kids (which includes sextuplets Hannah, Collin, Alexis, Aaden, Leah and Joel, as well as 17-year-old twins Mady and Cara), choose to visit with Jon. In 2017, Jon asked fans to donate money to help him fight for custody of his children. His GoFundMe campaign raised about $3,300. Whoever wrote that for her deserves a raise. Bra-vo. Kate is the worst. Happy to see Collin, I hope he’s doing well. Collin! So happy to see him. It is a bit interesting that he was able to visit Jon, but didn’t see Kate. Maybe he was allowed to make that decision for himself. This family is so fractured and it seems like the common denominator here is Kate. It’s sad for the kids who are clearly being pulled in different directions, even on their birthday. That cake is way to small for that many people. I’m not sure if this is the only way she gets to visit Collin but she looks so happy to see both of them. I’m so glad she has a mind of her own and is strong enough to go against the grain and spend time w/her Dad and brother… the pics were heartwarming. The lost relationship I feel the most sad about is Cara and Jon. They seemed so close. It’s a shame that’s been broken but I feel torn about Collin. It makes me sad bc he is away from all his brothers and sisters while the rest of them have each other but at the same time I think he’s the luckiest one of all to be free of Kate and her insufferable, self-centered, bitchy, controlling parenting. So great to see Colin! Good for Jon and glad Hannah saw him too! The photo Kate showed was an empty chair beside the other 5 sextuplets. Sooooo happy to see a Pic of Colin …all Kate does is post pics of her damn dogs…that she Claimed to hate on previous seasons. I hope Colin moves in with Jon. And Kudos to Hannah! For going against her idiot mother. Happy Birthday Kids! ? No, not ADHD, she’s VERY focused on neatness and perfection. People who have ADHD have problems getting things done. Probably OCD, and I agree she’s SO stuck on herself. Narcissistic. I kind of have the same sad feeling about this family. So disjointed. Collin obviously has issues that we are not privy to. I hope he is getting the care he needs. On a positive note, the cake is cute. I think Kate has a lot of mental instability and an extreme case of ADHD. Everything she wrote was “me” and “my”. Who would want to date her? She is no prize. Everything has to be her way. Why does TLC keep promoting such an insufferable woman? I never hear or read of anyone liking her. Who would possibly watch this show? They’ve got to be paid actors she will date. This family just makes me feel sad… ?